The concept is that of providing better protection from gas / coal dust explosions in a coal mine environment with a system which is more efficient and more cost effective than both the existing timber shelf type stone dust barrier and the water-trough barrier. As has been described, the "Stone Dust Bag System" can protext without the continual "move-up" of barriers. "UK Coal" experience confirms that the bag system avoids repetitive work and intensive maintenance required by conventional explosion protection barriers. The "Stone Dust Bag System" is easily designed, very quickly installed, and when in place is easily "checkable" by sight from the ground. This makes compliance with safety requirements and maintenance of the system far more achievable than with conventional systems. For these reasons the "Skillpro Stone Dust Bag System" has major safety factor and cost advantages when compared to the conventional barrier systems. Rigorous and documented testing has been undertaken in mine explosion galleries in Australia, in Canada, in Germany and in South Africa. The "Skillpro Bag" is the only such tested product worldwide, and is available only through "CJA Mining Ltd" in Europe. The system is being adopted by "UK Coal Mining Ltd", supported by the "UK Health and Safety Executive Mines Inspectorate". 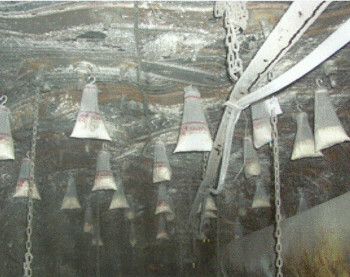 Another practical problem with the conventional system is the determination of shelf type, and weight of stonedust appropriate for each application. With the "Bag System", there is only one size bag and the number of bags needed is easily calculated based on the roadway dimensions. A major cost factor with the conventional barriers, is the requirement to systematically "move-up" the barriers to remain within the prescribed "optimum distance from source of ignition". The work involved can be seen to be costly and repetitive, avoiding this is another "Stone Dust Bag System" advantage. The bag system triggers at lower pressure levels than any other type. Although the "Stone Dust Bag System" can be hung in the form of concentrated barriers as prescribed in regulations for the shelf and trough types, the most effective mode is the "Distributed Barrier". 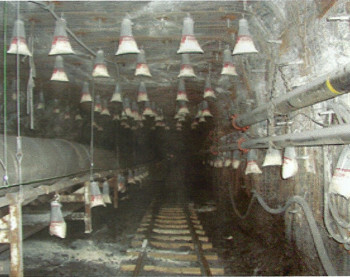 In this mode, the bags are hung at a set number per metre as the roadway is driven, and remain in place for the working of the longwall coal face. 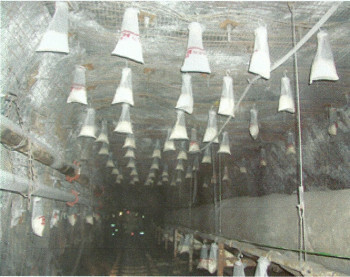 The "Stone Dust Bags" are hung at a rate per metre, determined by the cross sectional area of the roadway and the length of the barrier required.